The term "betrothal" in Jewish law must not be understood in its modern sense; that is, the agreement of a man and a woman to marry, by which the parties are not, however, definitely bound, but which may be broken or dissolved without formal divorce. 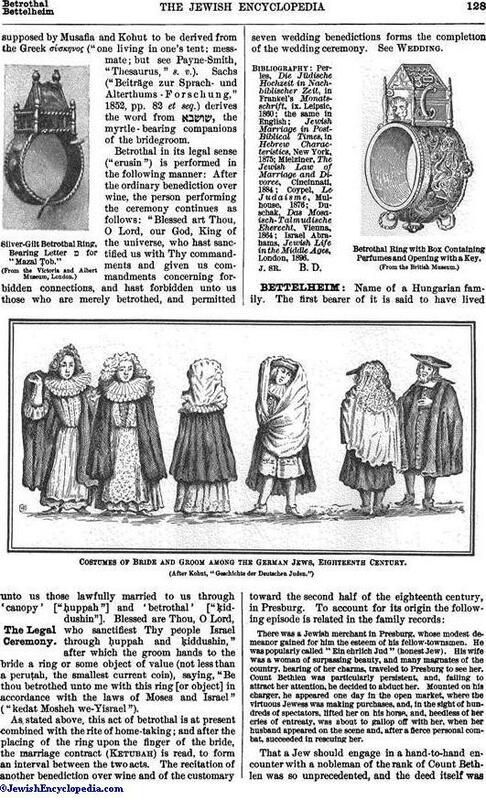 Betrothal or engagement such as this is not known either to the Bible or to the Talmud, and only crept in among the medieval and modern Jews through the influence of the example of the Occidental nations among whom they dwelt, without securing a definite status in rabbinical law. 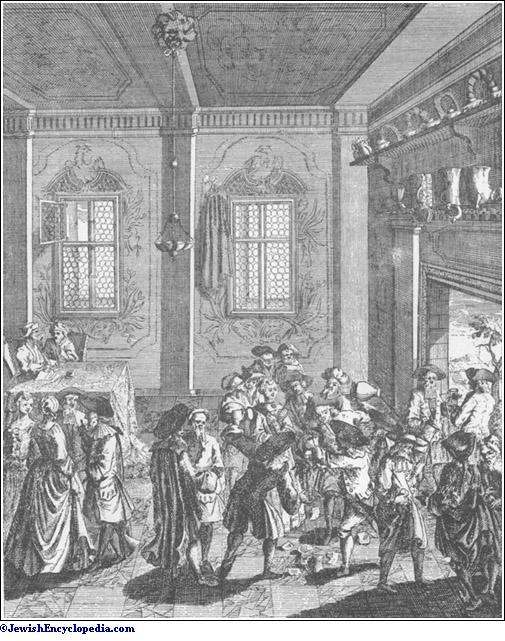 Scene at a Betrothal of German Jews, Eighteenth Century. After the betrothal a period of twelve months was allowed to pass before the marriage was completed by the formal home-taking ("nissu'in," "liḳḳuḥin"). In case the bride was a widow or the groom a widower, this interval was reduced to thirty days (Ket. v. 2; Shulḥan 'Aruk, Eben ha-'Ezer, 56). After the dispersal of the Jews had brought them into contact with the Western peoples, this arrangement was felt to be inconvenient and out of harmony with the prevailing views. It therefore becamecustomary to perform the entire marriage ceremony, betrothal and home-taking ("erusin" and "nissu'in"), at one time; and an affiancing or engagement similar to that prevailing among non-Jews was introduced. This was not an entire innovation, as its roots already existed in the custom of "shiddukin" or consent to marry, which existed in the days of the Talmud and probably also in the Biblical age. It was considered indispensable by the rabbis that a man should gain the good-will and consent of his prospective bride before entering upon a contract of marriage. Rab, the Babylonian amora, was accustomed to punish severely any one who married without first having persuaded and gained the consent of his wife (Ḳid. 13a; Yeb. 52a et al.). What was in the Talmudic age a mere personal matter became in later times a formal custom, which was celebrated with much pomp. At these occasions it was customary to make out a formal contract to marry and to stipulate that a penalty should be imposed upon either party who should fail to fulfil his or her part of it. Such agreements were known as "shiddukin" (consent to marry), and also as "tenaim" (conditions), or among German-speaking Jews "ḳenas-mahl" (penalty-feast), because of these stipulations and penalties. They are still customary in many countries in modified form. There is now no legal duration of time between betrothal and marriage, the length of the engagement being left entirely to the option of the parties concerned, except that the marriage may not take place in less than seven days after the agreement to marry has been reached (Nid. 66a; Shulḥan 'Aruk, Yoreh De'ah, 192). In Talmudic days, as in modern times, gifts formed an important feature of betrothal and marriage customs. These were of several kinds. 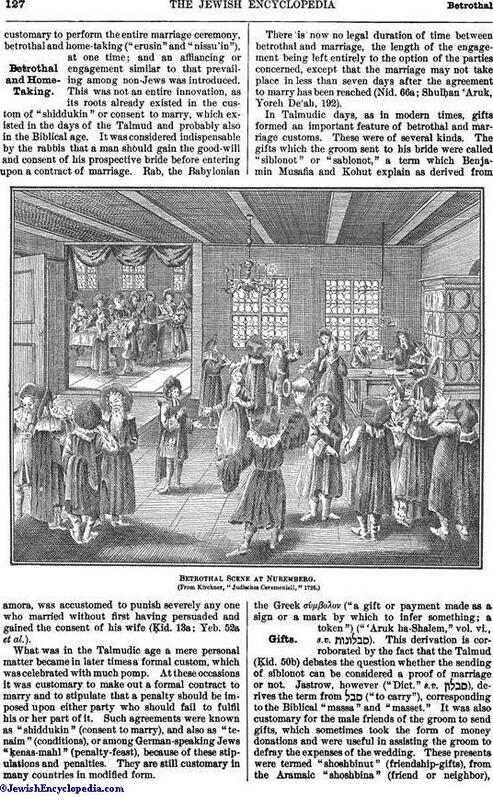 The gifts which the groom sent to his bride were called "siblonot" or "sablonot," a term which Benjamin Musafia and Kohut explain as derived from the Greek σόμβολον ("a gift or payment made as a sign or a mark by which to infer something; a token") ("'Aruk ha-Shalem," vol. vi., s.v. ). This derivation is corroborated by the fact that the Talmud (Ḳid. 50b) debates the question whether the sending of siblonot can be considered a proof of marriage or not. Jastrow, however ("Dict." s. v. ), derives the term from ("to carry"), corresponding to the Biblical "massa" and "masset." 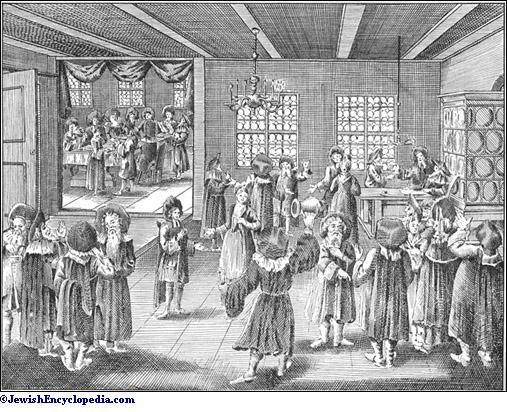 It was also customary for the male friends of the groom to send gifts, which sometimes took the form of money donations and were useful in assisting the groom to defray the expenses of the wedding. These presents were termed "shoshbinut" (friendship-gifts), from the Aramaic "shoshbina" (friend or neighbor),supposed by Musafia and Kohut to be derived from the Greek σόσκηνος ("one living in one's tent; messmate; but see Payne-Smith, "Thesaurus," s. v.). Sachs ("Beiträge zur Sprachund Alterthums-Forschung," 1852, pp. 82 et seq.) derives the word from , the myrtle-bearing companions of the bridegroom. 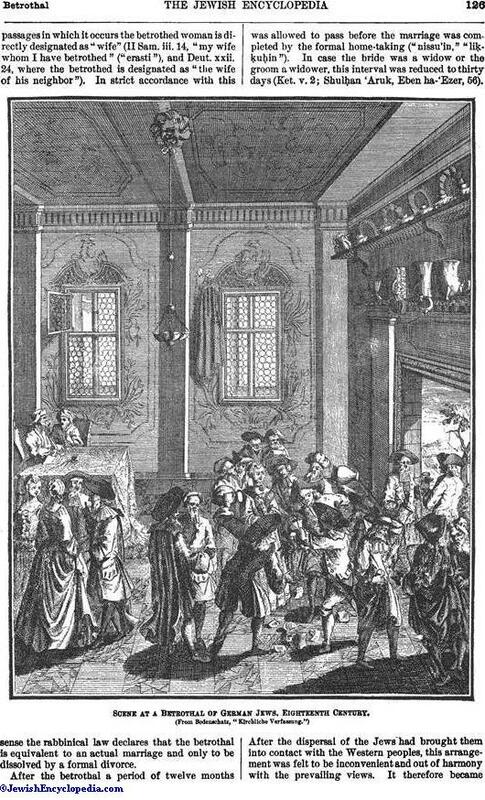 Betrothal in its legal sense ("erusin") is performed in the following manner: After the ordinary benediction over wine, the person performing the ceremony continues as follows: "Blessed art Thou, O Lord, our God, King of the universe, who hast sanctified us with Thy commandments and given us commandments concerning forbidden connections, and hast forbidden unto us those who are merely betrothed, and permitted unto us those lawfully married to us through 'canopy' ["ḥuppah"] and 'betrothal' ["ḳiddushin"]. Blessed are Thou, O Lord, who sanctifiest Thy people Israel through ḥuppah and ḳiddushin," after which the groom hands to the bride a ring or some object of value (not less than a peruṭah, the smallest current coin), saying, "Be thou betrothed unto me with this ring [or object] in accordance with the laws of Moses and Israel" ("kedat Mosheh we-Yisrael"). Silver-Gilt Betrothal Ring, Bearing Letter ם for "Mazal Ṭob." 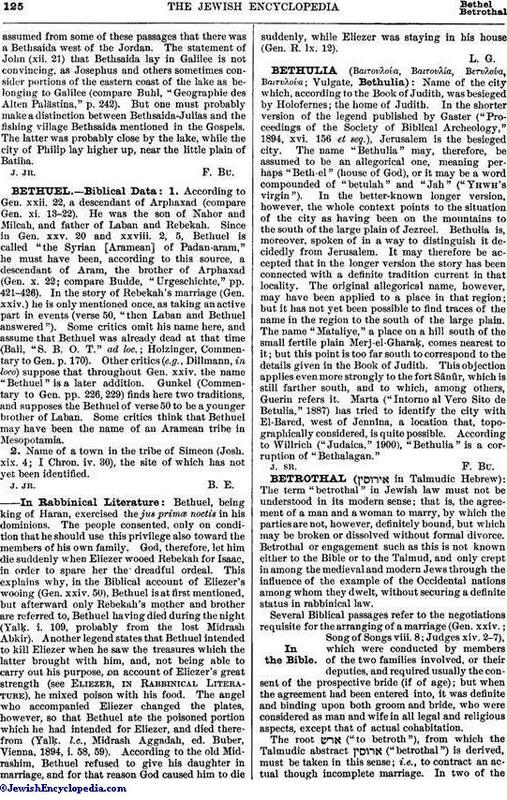 As stated above, this act of betrothal is at present combined with the rite of home-taking; and after the placing of the ring upon the finger of the bride, the marriage contract (Ketubah) is read, to form an interval between the two acts. The recitation of another benediction over wine and of the customary seven wedding benedictions forms the completion of the wedding ceremony. See Wedding. Betrothal Ring with Box Containing Perfumes and Opening with a Key. Israel Abrahams, Jewish Life in the Middle Ages, London, 1896).